If you are looking to restore your hair, making it look and smell better, you may opt to try the new Redken Styling - Rough Clay. This clay is designed to help your hair stay in place, allowing you to give it a refined look. Thanks to a colour-safe formula, you don't have to worry about permanently changing your hair's colour. UV filters incorporated into this rough clay solution help protect your hair from the elements, whether water, dirt or wind. 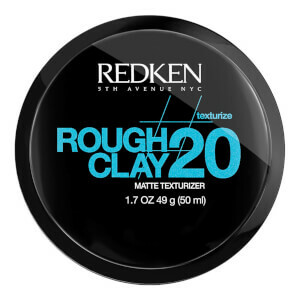 Using this rough styling clay is simple - rub a small amount in your hands, apply to dry hair and keep applying until the texture is sufficiently strong. Finally, rinse your hair out with shampoo. Redken is a quality brand, no doubt about that. This product works fine. This one is one of my alltime favourites! Great hold, texture and volume let you create those messy yet styleish looks. It is reshapeable trugh out the day and dosnt make your hair look "greasy". In my opinion one of the best products for quick hairstyles, great from Redken as always, i feel blessed that i found out about that company, im useing conditioner shampoo and hair paste at the moment and rly enjoy every product but this one is my personal favourite. Big props to Mankind for great service as well. Wuld strongly reccomand you trying this out if you havent yet! I have tryed alot of different products over the last couple of years and this one is one of the best if not the best one i have ever tryed out! Great hold, matte finish and reshapeable/flexible trugh out the day it is just perfect for creating kinda messy, texturized hairstyles with loads of volume. I strongly reccomand trying it out. In my opinion it is no wonder this product won Prestige beauty rewward 2014, it is just great!